Sandal season is upon us, and if you're in the market for a new pair, we're right there with you. Each season, there will be of-the-moment trends that come and go, but a pair of comfy, affordable, survive-anything sandals are a wardrobe necessity for even the most polished of dressers. But what tops the list of must-own sandals? 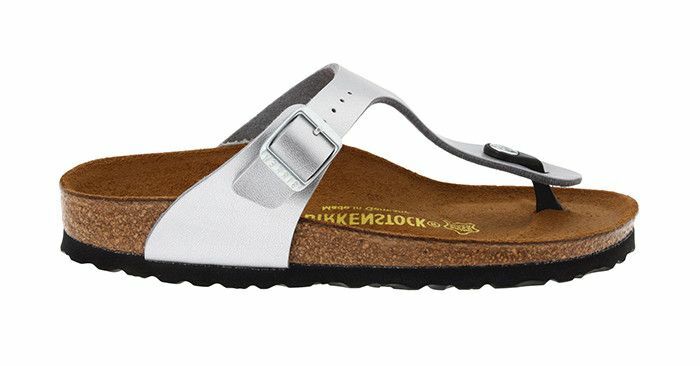 We tapped the experts at Rank & Style to find out the top-selling styles in the U.S. Based on sales numbers, reviews and buzz, there was one pair that stood out from the rest: Birkenstock's Gizeh sandals. Reviewers call them "by far the best sandals you can get for your feet," noting that they not only wear them out but buy them time and again. And since Birkenstocks remain a favourite among the fashion crowd, these shoes perfectly toe the line between comfort and style. Read on to shop the most popular sandals, then shop more from Birkenstock. You'll be needing these for all your summer activities. All black is the cool-girl way to wear Birkenstocks. A fresh pop of colour is always a good idea in spring. Studs toughen up a classic slide. You won't even realise it when you start wearing these with everything. When you need to channel your wild side. The Arizona sandal also looks chic with socks during the colder months. Add some shine to your spring footwear. A pristine white sandal is everything. Besides being cool, they're also incredibly comfortable. Next up! Prediction: These 11 new-in pieces will definitely sell out.